Tiramisu Jar; Mascarpone mousse, espresso bark. Yountville seems to really be hopping these days with an incredible concentration of superb dining destinations of all kinds. Thomas Keller, Michael Chiarello, and, more recently, Richard Reddington, have all built important bases here. Reddington is best known for his flagship outpost, Redd (where we also enjoyed a fabulous meal) but on this night we opted for the more informal Redd Wood. I confess this was my first meal inside the restaurant itself, but many tasting days last fall ended with Redd Wood takeout. The informal, trattoria-inspired room is small, cozy and quite welcoming. 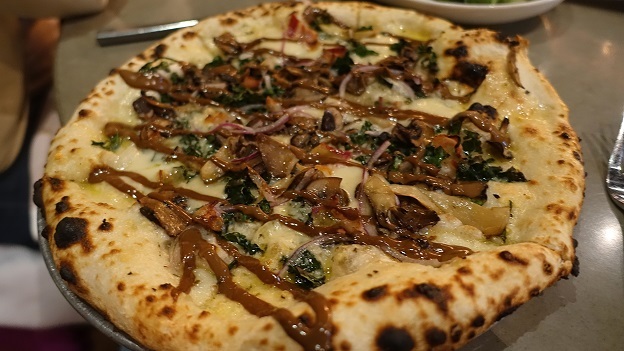 At Redd Wood, Chef Reddington serves up a classic, Italian-inspired menu of comfort food. 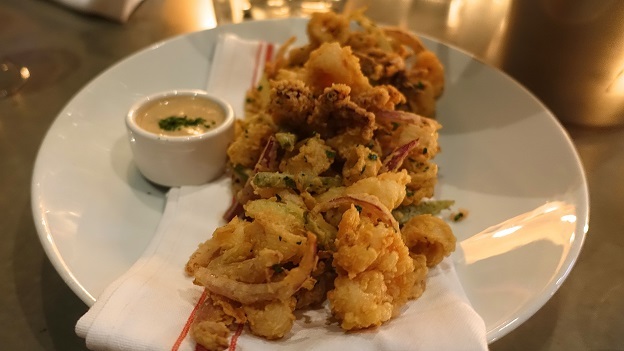 The fritto misto, a staple of the Italian kitchen, is rarely this delicious. We basically devour the fried calamari and gulf shrimp. The kids have the mozzarella, tomato and basil pizza, which, by the way, is delicious, while the adults indulge in the far richer pizza with mushrooms, Asiago, pancetta and Taleggio. Both are superb. 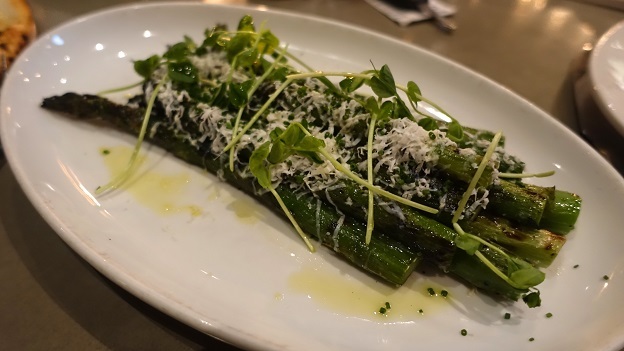 I also enjoy the grilled asparagus, a healthier choice, to be sure. I am less enamored with the bucatini, which are tasty, but oversauced for my taste. Redd Wood offers a small, but well-chosen list curated by Master Sommelier Willi Sherer that is organized by weight and flavor profile rather than by geography. One of my favorite parts of the list is “THE KING (NEBBIOLO)” which features a number of good choices from Brovia, Vajra and Antoniolo, among others. We start with Nino Franco’s NV Prosecco Rustico, which sets the mood for a relaxing dinner after a long day of tasting 2014 Napa Valley Cabernets. As much as the Nebbiolos are tempting, we can't resist the allure of Arnot-Roberts’ 2012 Syrah Clary Ranch. The 2012 needs quite a bit of time to unwind, but still only reveals a fraction of the potential I sensed when it was younger. I suspect bottle shock is the issue, so I would not recommend opening a bottle anytime soon. The panna cotta and tiramisu are both divine. Neither are complicated or technically hard to make, but, as is always the case with Italian cooking, it all comes down to the purity of the ingredients and simplicity of execution. Here, too, Redd Wood truly excels. Readers visiting Napa Valley won’t want to miss Redd Wood. 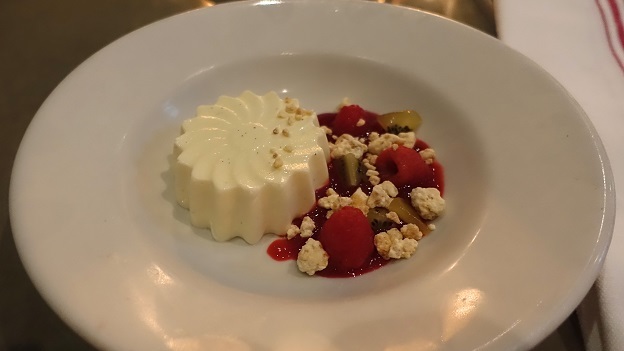 The warm atmosphere and menu full of Italian-inspired classics makes Redd Wood an ideal spot for an informal lunch or dinner, as well as an excellent choice for families with young children.